The best-selling author explains why these simple qualities make for the most effective leaders. What are the top qualities of great leaders? It’s not a great mystery, said Simon Sinek at the World Business Forum on Wednesday. As the motivational speaker and author explained, it really boils down to three things: selflessness, empathy, and an ability to manage anxiety on your team. Here is a look at each trait, and why it is so valuable for you to cultivate. 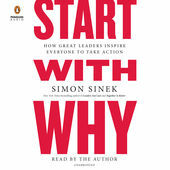 Speaking of taking care of others, Sinek added, “the more we do good for each other, the more we want to do good for each other.” He recounted the time he picked up loose papers for a man when he saw them slip out of his bag. The man was grateful, but Sinek said his actions went further than that. They motivated someone who saw them to do something kind. Kindness begets kindness, Sinek went on. It’s holding the door for someone, making a new pot of coffee, and letting someone into your lane. Putting others ahead of yourself–“that is the practice of leadership,” he said. Stress and anxiety are enough to make people dishonest and to sabotage their performance at work. When your body is flooded with cortisol, or the chemical that produces anxiety, “you biologically restrict empathy and trust,” Sinek said. Don’t be that kind of boss–if you’re the one inducing fear and anxiety in your employees, you’re never going to have their trust. The solution is clear: Work on managing your own stress and “be the leader you wish you had,” he said. Your team will appreciate it.